Quantities are approximate. The above makes enough to fill a 12 inch baking dish and serves 2. We used to make french bread pizza all the time as a snack, but gave it up to try and avoid carbs that come from bread. This recipe is a great low carb alternative and is our new favorite snack or light meal. We use frozen riced cauliflower that usually comes in 10 or 12 oz bags. No need to pre-defrost it. Just grab one from the freezer and you're ready to go. Alternatively, fresh cauliflower riced in a food processor should work fine. Heat the cauliflower rice in a dry skilled over medium high heat, stirring occasionally to remove moisture. About 10 minutes. When it looks somewhat dry, reduce heat and add parmesan cheese and onion powder. Stir until the parmesan is melted. This will look like a sticky mess. Remove from the heat and stir in the egg. You may do this in the pan or transfer everything to a bowl before adding the egg. Place a sheet of parchment paper in a 12 inch baking dish with some paper extending up the sides. Rub a little olive oil on top. Spread the "dough" out on top of the parchment and use a spoon to flatten it into a round pizza crust looking shape. 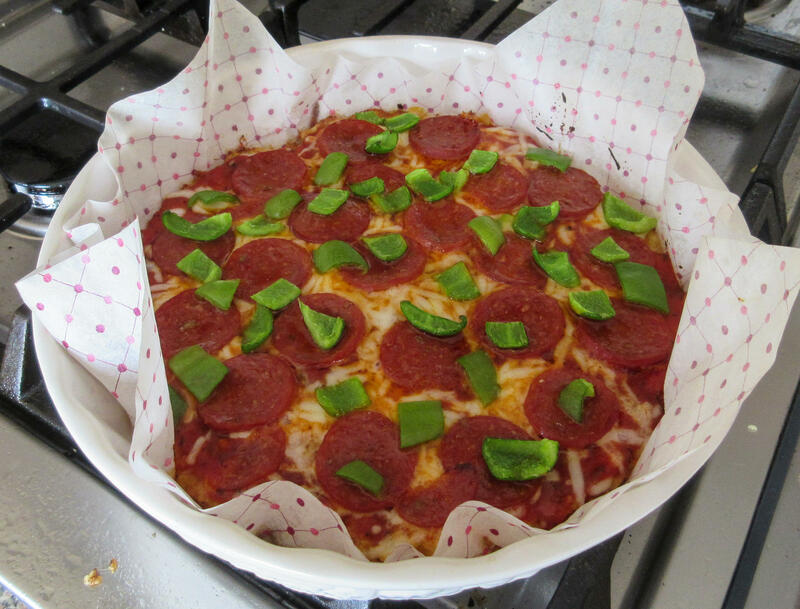 Remove from the oven briefly to add your favorite pizza toppings. We use some tomato marinara sauce topped with mozarella cheese, plenty of pepperoni and fresh chopped green peppers. Return to the oven for an additional 10 minutes to heat the toppings. Remove and prepare to serve. We lift the whole thing out of the baking dish using the parchment sheet. Place this on a cutting board or plate, slice in half and then slide each piece onto a plate.